ILI - the library innovation conference - is where people come to share great stories of library innovation around the world. Our call for speakers has just opened and we want to encourage you and your colleagues to come along and tell us about your real-world projects, initiatives and transformations. 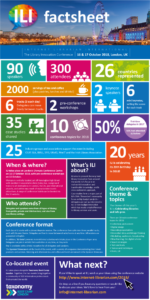 To help you, this infographic (left) gives you more information about ILI at a glance, and you can read more about the conference theme and topics here. • Would you be interested in sharing your experience with an informal group or one-to one? • Would you be interested in doing a lightning presentation? • Or running a TeachMeet? • Perhaps you could present an interactive demonstration of a library innovation? We’d love to hear from you and welcome your suggestions. Submit here - the submissions deadline is 13 April 2018.